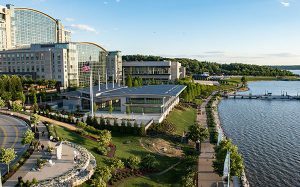 USCAP’s Annual Meeting at National Harbor, Maryland, close to the Capitol, is the magnet for global pathologists to come together to think out loud about what’s new, exciting and relevant in translational research and anatomic/molecular diagnostics. It’s the forum for intellectual stimulation, information exchange, and social interaction. USCAP is transforming the way pathologists learn by providing interactive education in stimulating venues that unlock their ingenuity. Under the glass dome of a unique conference center with contiguous hotel, you will find it convenient to move within a single location to take advantage of learning opportunities, receptions and networking. Shuttles to Washington, D.C. will facilitate your excursions. The 2019 program is designed to exceed your expectations and expose you to contemporary and vibrant pathology education at its best. The Academy encourages you to make the most of this conference, designed for a broad spectrum of learning and social opportunities from the Long Course on Dermatopathology to the extraordinary Generation U celebration. Augment your general registration with access to the plethora of Companion Society meetings, and pre-select short courses, interactive microscopy sessions, evening specialty conferences and special courses in genomics and leadership. Do this up front when you register for the meeting- don’t wait to secure your place in courses that mean the most to you and which usually sell out. Each interactive microscopy session can accommodate only nine learners, so be sure to review the fantastic lineup of instructors and topics. We intend to welcome 100 registrants for each Hot Topics session, but seating is limited. Act early. The Academy generally receives more than 3000 abstracts, with top research destined for platform and poster sessions. Dr. David S. Klimstra of Memorial Sloan-Kettering Cancer Center will deliver the Maude Abbott Lecture and Dr. Jeroen A.W.M. van der Laak of the Radboud University Nijmegen Medical Centre (The Netherlands) will address artificial intelligence, computational pathology and computer-based learning for the Timely Topics lecture. The Generation U party is a celebration of our profession and USCAP’s expression of appreciation for all attending the meeting. The USCAP Honors provide special recognition for sustained achievement in our discipline. USCAP regularly reinvents its conferences with an eye on the cutting edge and the growth curve. Personalized education, mentoring and outreach are core values that permeate the character and fiber of the Annual Meeting. Experience it for yourself, engage for life, and make USCAP your ultimate learning destination.